Firefighters in Southern California are making progress in their battle against raging wildfires. 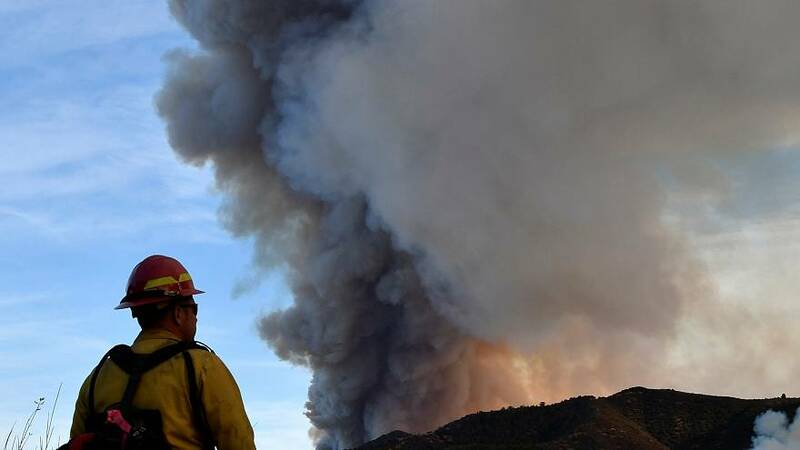 The Santa Ana winds that have fueled the blazes have dropped off slightly, allowing officials to lift evacuation orders for parts of Ventura and Santa Barbara counties. But, as forecasters predict the winds will pick up strength on Sunday, fire crews are under pressure to control the blazes. Since the first fires erupted on Monday, dust and tinders are making the atmosphere and environment increasingly difficult to breathe. The largest blaze, the Thomas Fire, has blackened 62 hectares in Ventura County and was 15 percent contained, the California Department of Forestry and Fire Protection (Cal Fire)said in a statement on Saturday night. The Skirball Fire in Los Angeles was 75 percent contained, while the Creek and Rye Fires in Los Angeles County were 80 percent and 65 percent contained, officials said. At least one person has been killed and 60,000 hectares of land have been destroyed in the fire; an area about the size of Chicago. The flames have also forced more than 200 000 people to evacuate their homes this week, many coming back to find ashes and rubble as nearly 800 buildings have burned own. California's governor Jerry Brown has blamed climate change for the intensity of the fire saying sitution like these are the "new normal and could happen every year."